What Is Iron Ore, How Does It Form, and What Is It Used For? 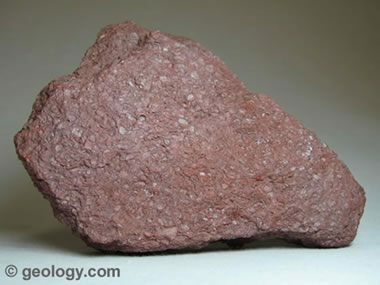 Iron Ore: A specimen of oolitic hematite iron ore. The specimen shown is about two inches (five centimeters) across. How Does Iron Ore Form? Nearly all of Earth's major iron ore deposits are in rocks that formed over 1.8 billion years ago. At that time Earth's oceans contained abundant dissolved iron and almost no dissolved oxygen. The iron ore deposits began forming when the first organisms capable of photosynthesis began releasing oxygen into the waters. 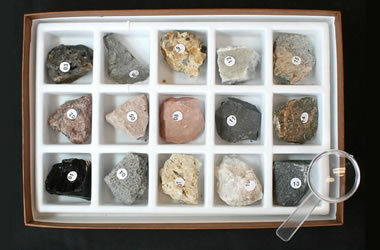 This oxygen immediately combined with the abundant dissolved iron to produce hematite or magnetite. These minerals deposited on the sea floor in great abundance, forming what are now known as the "banded iron formations." The rocks are "banded" because the iron minerals deposited in alternating bands with silica and sometimes shale. The banding might have resulted from seasonal changes in organism activity. Steel Mill: Most iron ore is used to make steel. 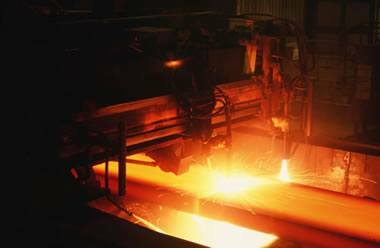 Here a steel slab is being cut to length in a steel mill. Image copyright iStockphoto / Alfredo Tisi. What is Iron Ore Used For? 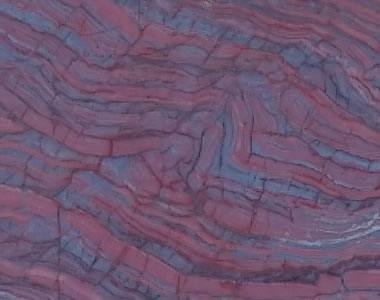 Banded Iron Formation: Close-up view of a banded iron formation. In this specimen bands of hematite (silver) alternate with bands of jasper (red). This photo spans an area of rock about one foot wide. Photo taken by André Karwath, GNU Free Documentation License.